Get the mother in your life a sweet new t-shirt that celebrates her nature to a “T”. See what I did there? It’s a t-shirt! The graphic on this t-shirt is very simple, yet it looks strikingly familiar. Maybe a little like The Godfather graphic? 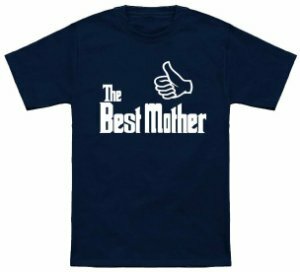 Either way stating “The Best Mother” with a big thumbs up is sure to get a grin. Choose from 13 different colors to make this t-shirt just right for the mother in your life. Maybe she loves the color Kiwi Green. Perfect! There is just that color. You can get this t-shirt in a wide variety of women’s sizes too, ranging from Small up to 6XL. It is made from cotton.